What happened with the Internet in 2010? How many sites/blogs were appended? How many Internet users were there? Here is the post to answer all your questions and many more. If it’s stats you want, you’ve come to the right place. We have scanned the web to put these stats together. We also did some additional calculations to get you even more numbers to discuss. So get ready for the good kind of information overload. • 107 trillion – The number of emails sent on the Internet in 2010. • 294 billion – Average number of email messages per day. • 1.88 billion – The number of email users worldwide. • 480 million – New email users since the year before. • 89.1% – The share of emails that were spam. • 262 billion – The number of spam emails per day (assuming 89% are spam). • 2.9 billion – The number of email accounts worldwide. • 25% – Share of email accounts that are corporate. 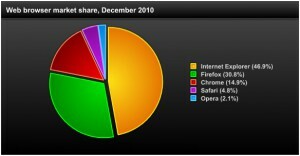 • 255 million – The number of websites as of December 2010. • 21.4 million – Added websites in 2010. 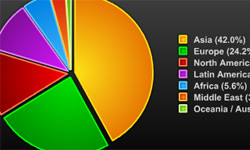 • 39.1% – Growth in the number of Apache websites in 2010. • 15.3% – Growth in the number of IIS websites in 2010. • 4.1% – Growth in the number of nginx websites in 2010. • 5.8% – Growth in the number of Google GWS websites in 2010. 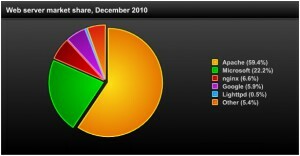 • 55.7% – Growth in the number of Lighttpd websites in 2010. • 88.8 million – .COM domain names at the end of 2010. • 13.2 million – .NET domain names at the end of 2010. • 8.6 million – .ORG domain names at the end of 2010. • 79.2 million – The number of country code top-level domains (e.g. .CN, .UK, .DE, etc.). • 202 million – The number of domain names across all top-level domains (October 2010). • 7% – The increase in domain names since the year before. • 1.97 billion – Internet users worldwide (June 2010). • 14% – Increase in Internet users since the previous year. • 825.1 million – Internet users in Asia. • 475.1 million – Internet users in Europe. • 266.2 million – Internet users in North America. • 204.7 million – Internet users in Latin America / Caribbean. • 110.9 million – Internet users in Africa. • 63.2 million – Internet users in the Middle East. 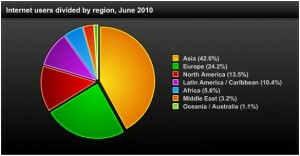 • 21.3 million – Internet users in Oceania / Australia. • 152 million – The number of blogs on the Internet (as tracked by BlogPulse). • 7.7 million – People following @ladygaga (Lady Gaga, Twitter’s most followed user). • 600 million – People on Facebook at the end of 2010. • 250 million – New people on Facebook in 2010. • 30 billion – Pieces of content (links, notes, photos, etc.) shared on Facebook per month. • 70% – Share of Facebook’s user base located outside the United States. • 20 million – The number of Facebook apps installed each day. • 2 billion – The number of videos watched per day on YouTube. • 35 – Hours of video uploaded to YouTube every minute. • 186 – The number of online videos the average Internet user watches in a month (USA). • 84% – Share of Internet users that view videos online (USA). • 14% – Share of Internet users that have uploaded videos online (USA). • 2+ billion – The number of videos watched per month on Facebook. • 20 million – Videos uploaded to Facebook per month. • 5 billion – Photos hosted by Flickr (September 2010). • 3000+ – Photos uploaded per minute to Flickr. • 130 million – At the above rate, the number of photos uploaded per month to Flickr. • 3+ billion – Photos uploaded per month to Facebook. • 36 billion – At the current rate, the number of photos uploaded to Facebook per year. So what do you think about his information statics? Let us know!